Alicia loved to paint and grow flowers. This bouquet came from her flower garden in Brunswick, Maine. Chrysanthemums are one of the most popular flowers in the world, next only to the rose. This glowing and beautiful piece of art was meant to brighten your life. In your office or in your home you would be rewarded with a spectacular bouquet every time you chose to reflect on it. Her full range of watercolors are masterful as she creates this stunning work of art. 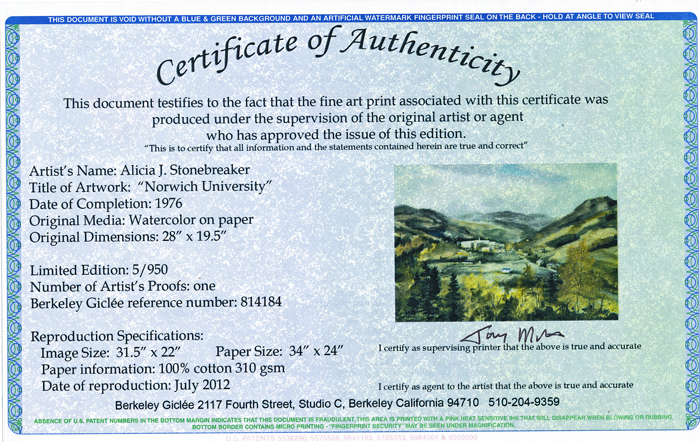 Our on line gallery is dedicated to Alicia's love and devotion of painting, drawing, teaching, and her zest for life. She was a devoted Mother and Wife that was loved by many, many people. We have a detailed biography of Alicia's life and influences if you are interested in learning more about Alicia.